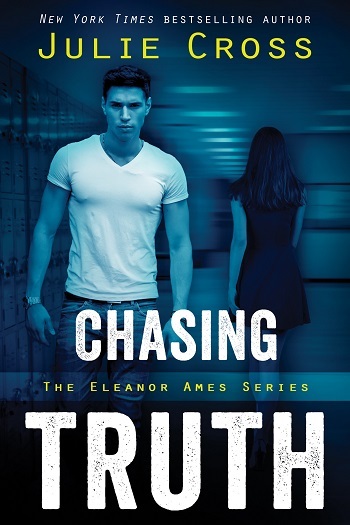 Fans of Veronica Mars or Ally Carter will love the snarky, whip-smart former con artist Eleanor, in this sequel to Chasing Truth. This is the second book in this series and it doesn't disappoint. Miles, Ellie, and Dominic are all thrown into the story and you get to see them mature, develop their skills, and see their relationships grow. Ellie is still reeling a little from the situation she found herself in at the end of book one. She wants to find a way to redeem her mom and put her dad where he belongs. When the opportunity presents itself, she'll need all of the people around her to pull off this con. You are given more background for Ellie and also get to meet a new family "cousin." Miles and Ellie deepen their relationship all while trying to navigate their inherent conclusion to mistrust everyone. I liked that they were able to continue their relationship, despite being on opposite "sides." Black and white don't belong in this story – it's all about shades of grey. The character who surprised me the most was Dominic. He was a breath of fresh, humorous air. I liked how he was able to help Ellie do her job but kept things light and funny. This story is full of twists and turns that you don't necessarily see coming. I can't wait to see what happens next. It has been 18 months since book one in this series and I was excited to finally be getting my hands on book two. Hiding Lies sees Miles in Turkey with his parents, and Eleanor going on a three week field trip to New York City. But the field trip is just an excuse for Eleanor to go undercover in her father’s current con, working with the FBI in the hopes of getting her mother’s prison sentence reduced. This story is full on from start to finish. Between school, her friends, her boyfriend Miles, her family, the FBI, and the mob, Eleanor has so many balls in the air. The collision of the different parts of her life keep Eleanor on her toes and we get to see her in her element, putting her skills as a con artist to good use. The story has a few good twists and turns but I kept waiting for everything to go pear shaped. I loved seeing Eleanor working all sides and trying to decipher right from wrong and good from bad, but it is a lot of presure on one high school student. Hiding Lies is an excellent, fast-paced action/mystery with a bit of family drama and some good solid teen romance and I had a great time reading it. I hope we don’t have to wait another 18 months for book three. 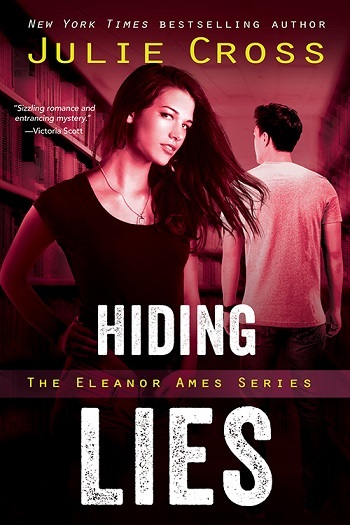 Hiding Lies is the second and possibly final installment in the Eleanor Ames series. I'd strongly suggest against reading this as a standalone. I read the first pre-release as well, so it has been a long while for me. If you haven't read the first in the series, I'd suggest reading books one and two back-to-back to get the optimal reading experience, as I struggled to remember the finer details after so long in between. If you enjoy rereading, and it's been a while since you read the first, I'd suggest a refresher. This is a spoiler-free review, where I will avoid major plot points, as this is considered a mystery and suspense young adult series. It was a slow start for me, not to say I wasn't enjoying said start – just that I was having difficulty remembering what had happened previously after reading 500 books in between. There was also a lot of threads going on, maybe two or three too many for young adults to grasp, giving a chaotic feel. So many things that there was no way there were enough hours in the day for Ellie and company to pull off what they were doing. I'm thankful my logical personality was tucked away while I read, not rearing its ugly head until after I had finished the book. After all, this is fiction. Ellie is a con artist who accidentally put her mother away in prison on their last job, 11 months ago. Now she's trying to right the wrongs (and that's all I can tell you to avoid spoilers. HA!). Ellie is not too stupid to live. She's not a damsel in distress. Ellie is logical, putting her feelings to the wayside to get through what needs to be done. This is where the emotions of the novel truly hit me hard. I'm a sucker for a punch to the gut sensation, where rejection and betrayals really tug my heartstrings and connect me to the narrator. Ellie is ashamed of her past, how she treated others as a means to an end. In actuality, as the pages go by, it's Ellie who is a means to an end, for everyone on the pages. No one is putting her first. No one is taking care of her. After all, she is a seventeen-year-old girl, and she should be someone's focus. No matter who is helping her, they have an agenda – they all lie to her. From the title to Ellie's inner monologue, one would assume it is Ellie hiding the lies... from my perspective, it's everyone hiding lies from her, as they ask things of her they shouldn't. There are two points that lowered my reading enjoyment, hence the three stars from the adult perspective. I feel young adults won't notice, as they will be swept up in the swoon-worthy teen romance and the mystery and suspenseful action. However, the adult in me did notice how things didn't make any sense when we got to the ending. Had I reviewed this immediately, my rating may have been higher, but after mulling the book over, nothing tied together in a lucid, logical, or even rational way. It made no sense whatsoever. Ellie's con family, the FBI renegade group, and the mafia, added with several governmental agencies, absolutely nothing tied them together, all the way to a rushed ending that tied the romance in a pretty bow. Truthfully, I felt the author was going to pull another trigger, that would have been an ultimate betrayal, but decided against it when it came time to do it. Otherwise, everything was illogical and too coincidental how everything fell into place. It also had the feel of an ending for the series, yet nothing was resolved. "We're going to let the adults handle it." I enjoyed being inside Ellie's mind, as I feel she was the most rational character of the bunch. The rest of the cast acted as if they too were teenagers, even when grown adults in high positions. That's where the book fell flat for me. Those in charge were all too bumbling, written so to allow teenagers to shine, which makes me fear for our country if that were the case. Dominic was a shining star, more so than Miles. By the way, what happened to Oscar? I have no idea if this is the conclusion, even though it had a feeling of finality. New breath could be breathed into it if the focus shifts to a new narrator, or if Ellie got away from everyone and started over. Ellie is an amazing narrator but being inside Dominic would be eye-opening. I highly recommend to young adults. For the more detail-oriented adult, I'd suggest reading quickly, then not mulling over how things got from point A to point B, all the way to point Z. Young Adult age-range: 14+ due to violence, kissing, and fade-to-black sexual situations. 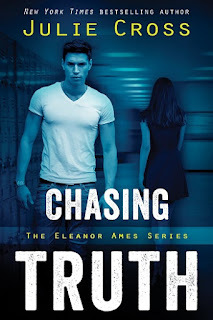 For reviews & more info, check out our Chasing Truth post. 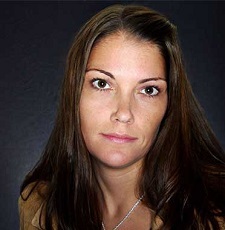 Julie Cross is a New York Times and USA Today bestselling author of New Adult and Young Adult fiction, including the Tempest series, a young adult science fiction trilogy which includes Tempest, Vortex, Timestorm (St. Martin’s Press). Reviewers on the Wicked Reads Review Team were provided a free copy of Hiding Lies (Eleanor Ames #2) by Julie Cross to read and review.